Well, hello there! Long time no see. I absolutely love this time of year. The weeks leading up to Christmas, including Thanksgiving, are always a Big Deal in elementary school. The excitement is palpable. And also contagious. So even though I've been crazy busy, it's an enjoyable busy. But yes, I'm also looking forward to having two weeks off here soon to snuggle with my busy girl (if she'll stop for a minute) and relax. Soon enough! I haven't been sewing very much in the past month. I have a huge art show at my school the last week of school before break. I've mainly been spending all my free moments working on that. One piece of art to hang for all 900+ students. Phew. I don't normally talk about the art lessons we do at school because honestly, I don't want to blog about work when I get home. But I am going to sneak in a pic of my first grader's paper mache penguins. They are fantastic. The armature is a paper lunch bag stuffed with newspaper and then twisted closed to make the beak. That and a whole lot of masking tape. 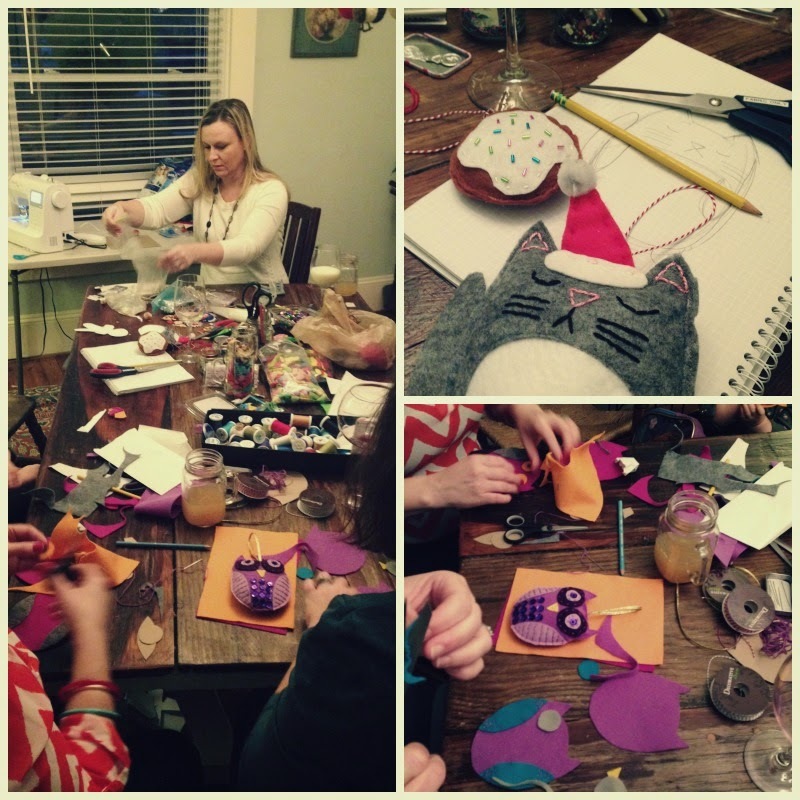 We also had our Crafty Christmas Party 3.0 the other weekend. This year a friend hosted it but I got the supplies together for the craft. We made hand-stitched felt ornaments- old school style. My parents have a whole set of felt ornaments that I believe they made with friends back when they were first married. They were always my favorite ornaments to hang. In fact, we didn't put them on the Christmas tree. Instead we always decorated our big grapefruit tree with them. Nostalgia! It was a fun party. Look at all those crafty supplies. Nothing original. I googled 'felt ornaments' and then drew out a few sketches from picture results ahead of time. The owl was a favorite. I made a few examples before the party and got hooked. Now I'm actually working on a few more to attach to presents when I wrap them. You really can't go wrong with combining crafting, cookies and wine, I say. You can read about the last two crafty Christmas parties here and here. I've sewn a bit in small little chunks of time. 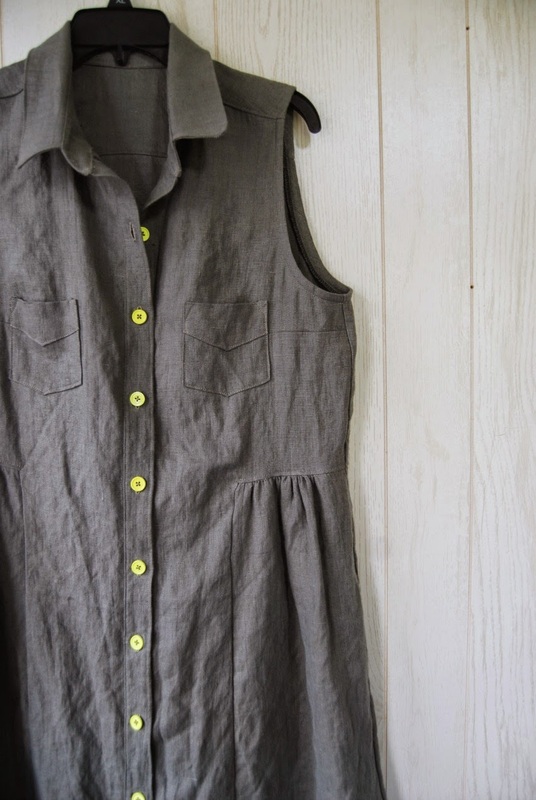 I have an almost finished shirt dress sitting on my dress form waiting for buttonholes and buttons. It was meant to wear to a wedding at the beginning of November. I also made another Jacqueline crop top in a pretty blue-green linen. It has been worn often- as soon as it comes out of the wash. So that's a winner in my book. But I think I am done with that pattern now. 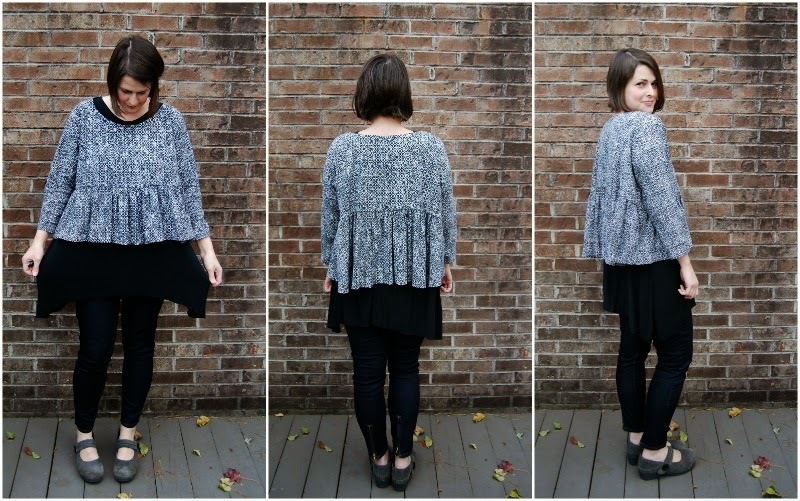 There are only so many big gathered tops you can wear, right? Before people start to wonder. 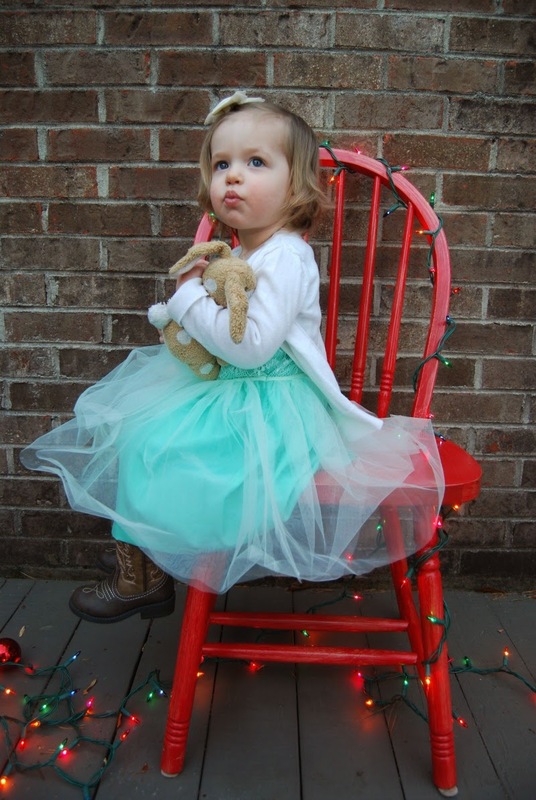 And last but not least, my sweet pea's Christmas card pictures. Look at the difference from last year! Gah. Slow down, time. We snapped these pictures as a last minute effort. We just threw everything together so I am really pleased that they came out so well. The red chair was perfect. No, I didn't make the dress. 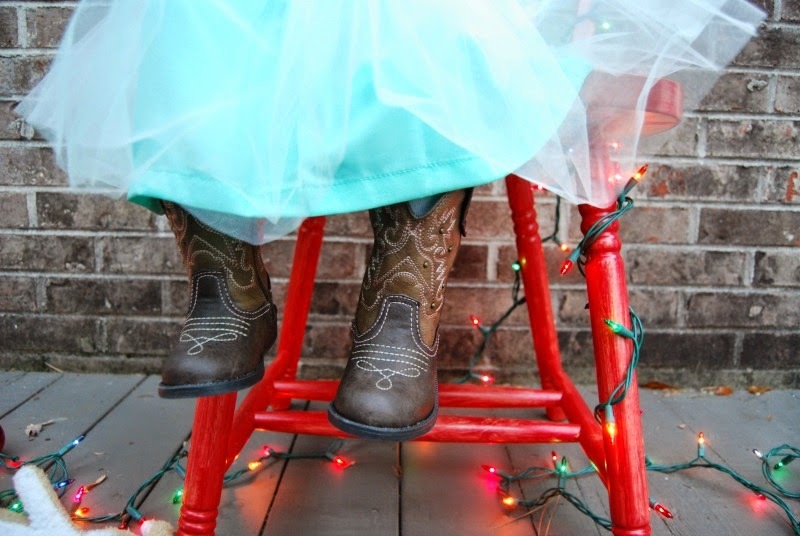 It's her party dress (Carter's) and her awesome cowgirl boots. I actually woke her up from a nap so we didn't miss the last bit of daylight (bad mom!). She is almost 20 months old now. Almost two. Holy cow. And she is a trip. Girl has some dance moves that neither her mom or dad have. It was a team effort to get the photos. If you could only see what J is doing behind me to make here smile. Ha! Oh, and also, I'm on Instagram now. I'm lizajanesews. I'm enjoying it as a quick little blog fix when I don't have time for blogging or full on blog reading. Merry Christmas, everyone! I hope you all have a wonderful holiday! I know, I know. Color-- I need some color in my life. But the black and white really makes getting dressed so easy. Everything works together. I have recently purchased some wild, colorful fabrics. So one day soon. 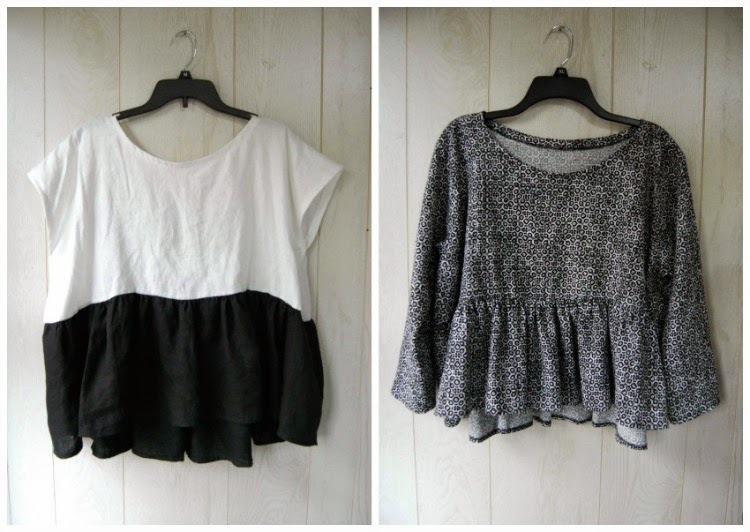 Anyway, I made a few more black and white tops. The first version I made was the black and white printed linen version with long sleeves. I made it up almost exactly as the pattern intended. Except I lengthened the back panel two inches and used one less panel of fabric in the gathered skirt. I really liked the first version I made, but it's short. It truly is cropped. I was having a hard time figuring out what to wear it with. Most of my jeans and pants were too low. I wanted to make something to wear under it to add some length. The pattern is intended to go over a slip, also included in the pattern (along with pants that really aren't my cup of tea). 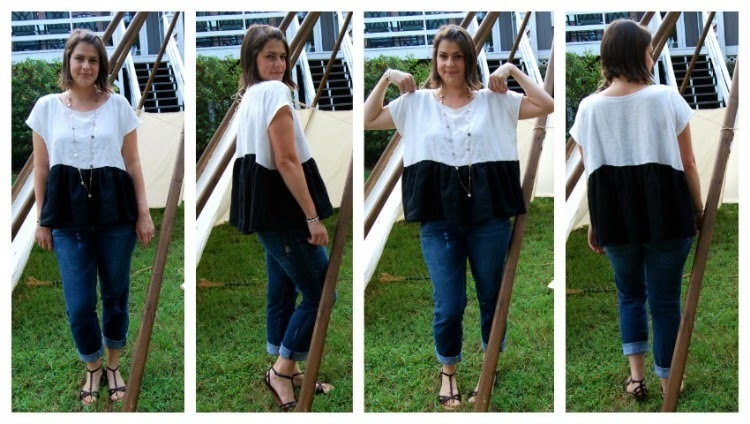 I wasn't sure how I felt about the cropped, gathered top over another longer layer. But I thought I'd try it out. 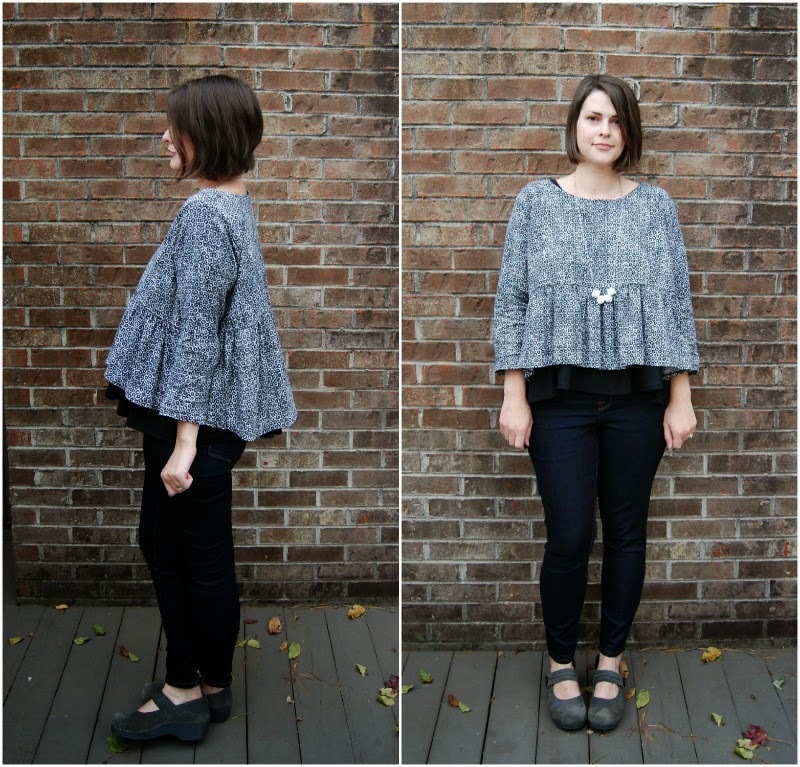 I made up the slip in a black rayon knit. Unfortunately my version is shorter because I didn't have enough fabric. I folded out about three inches of length right from the middle of the pattern and then redrew the side seams to match. So my version is about three inches shorter, but taken from the middle. I did not like the asymmetrical handkerchief hem when I was done. It just looked sloppy in a knit. So I made it symmetrical. I don't love it underneath the linen top. It's okay. It's really different. But I am loving the long knit tank with other things. It actually has been worn a lot with long cardigans and skinny jeans. The armholes are super duper low, though, so no wearing it on it's own without some modification. 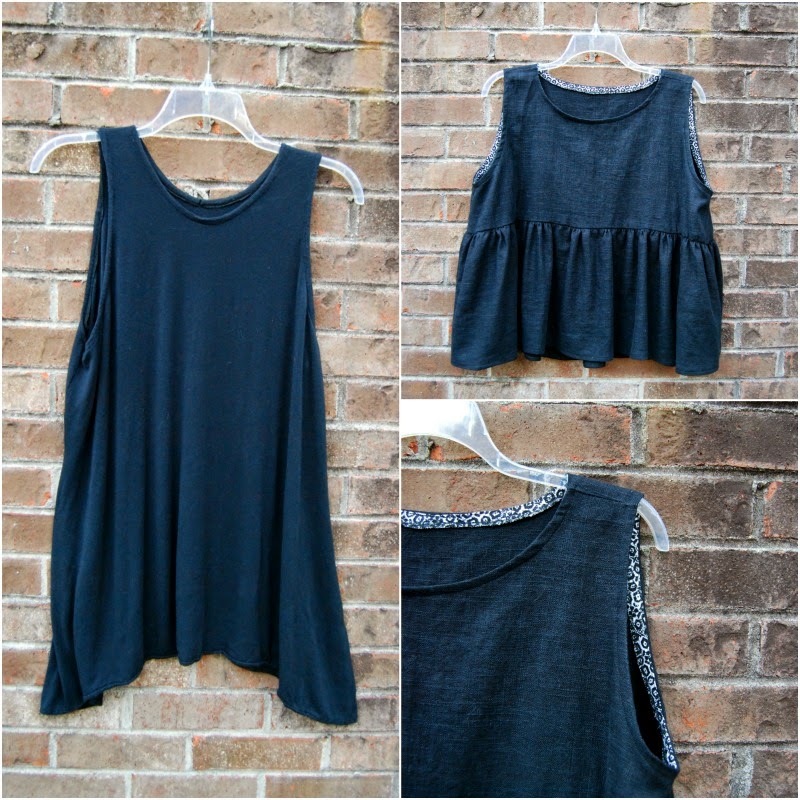 Next, I decided to try a sleeveless version of the same crop top pattern in a black linen. I made up the crop top pattern just like I did with the black and white version but excluding the sleeves. I also added two more inches of length to the front and back so it would hang out the bottom. The result is a whole lot of volume. Mega fluffy. But I'm kind of digging it. It's different, too. Here are the two black tops together. I used the printed linen for the bias facings on the cropped version. So it looks like a set with the original top. I'm sticking in this last top because it doesn't deserve it's own blog post. 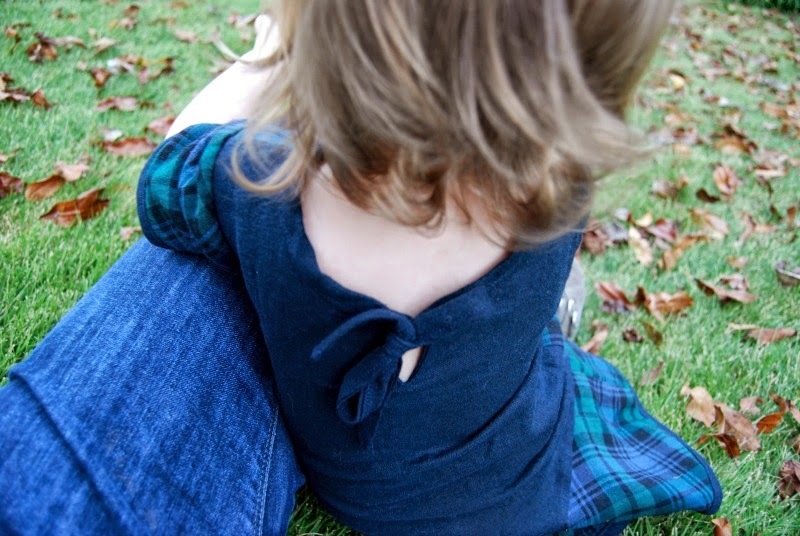 Remember the plaid disaster in this post? 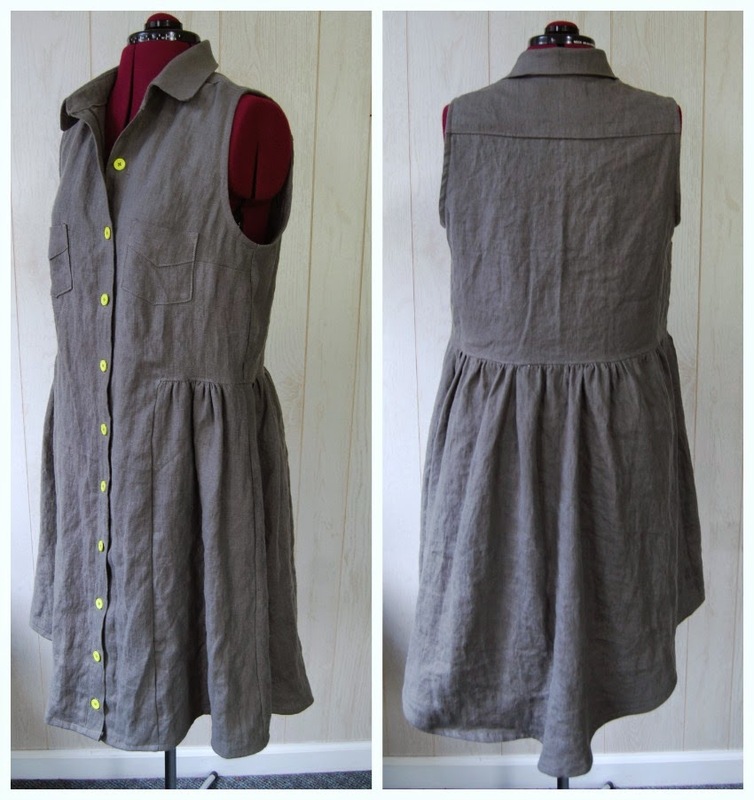 Simplicity 1366. I decided to give the top a go since it seems to have such good reviews. I made it in a white linen and one size smaller than I would normally cut. Remember I bought the wrong size pattern envelope and had to do some 'grading' to try and make the skirt work. This top is a size 12. I usually wear a 14. And it's still really boxy. Just something to keep in mind. The dropped shoulder is pretty cool. It does have a very modern shape. I don't hate it, but the length is really short on me again. I'm at a loss as to what to wear with it. I'm going to hang on to it but I'll have to figure out something later. I'm wearing it with my skinny jeans for photos but I don't think I'd rock this look in my everyday life. I feel a little exposed without my bum covered. My remote timer caught me in a sneeze. Ha! So some more basics that are decent. Nothing too terribly exciting. I think I like the black cropped version best with the original top. You really can't go wrong with sewing in black and white. Well, I guess you can always go wrong somewhere, but you know what I mean. Happy sewing! 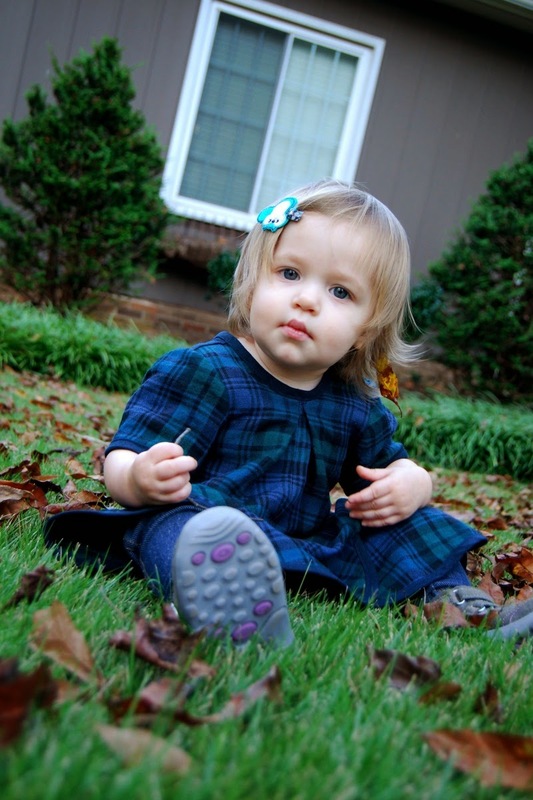 It's starting to look like an exclusive toddler sewing blog 'round here. But I promise that's not the case. I actually snapped some photos of the last few things I've made for me. 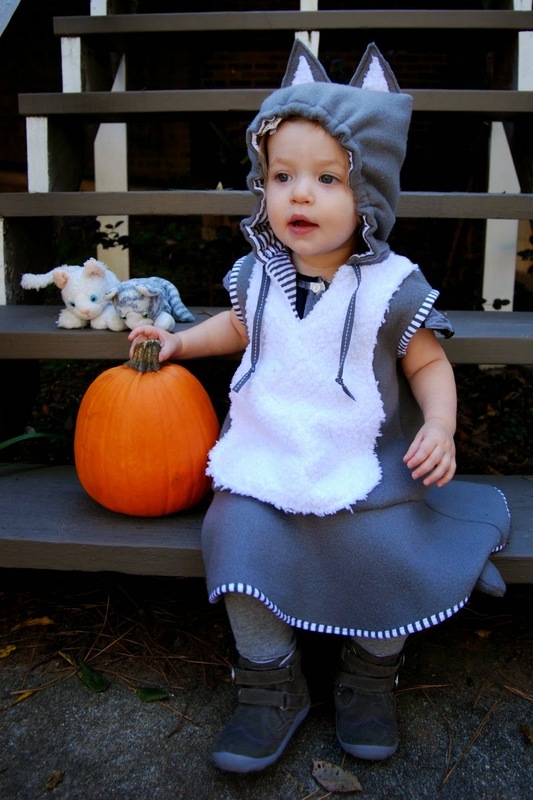 But of course I wanted to post about Jane's costume before Halloween. And just because I'm reminiscing...remember last year's costume? Crazy how much she has changed in a year. I'm not sure that this new costume tops last year's. In fact, I don't know that any costume will ever top that one. But this one sure did turn out pretty cute. Kitties. Jane is obsessed with kitties. Or kkkhhhhhhh, as she says it. We're working on it. So kitty costume it was. 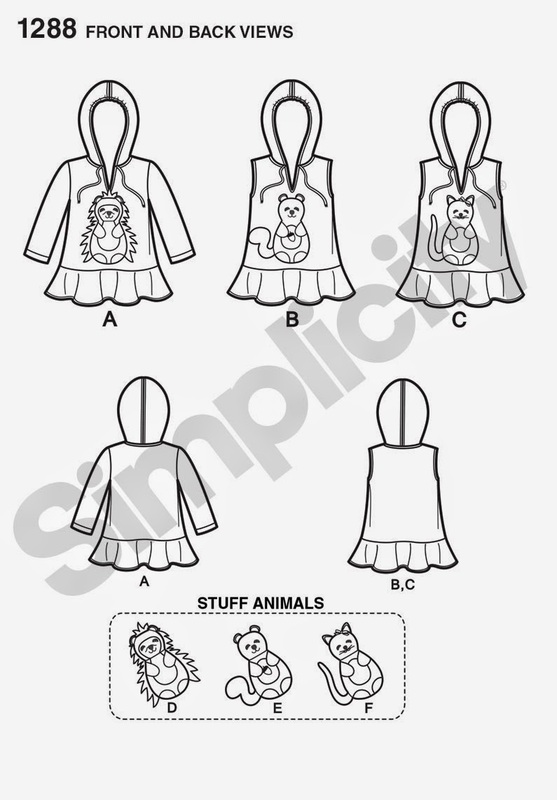 I started with Simplicity 1288, a toddler dress pattern that includes a bunch of different appliqué patterns for the front. I thought it would be a good pattern for a costume that is not really a costume. As in, I can pull it on right over top of her regular clothes. 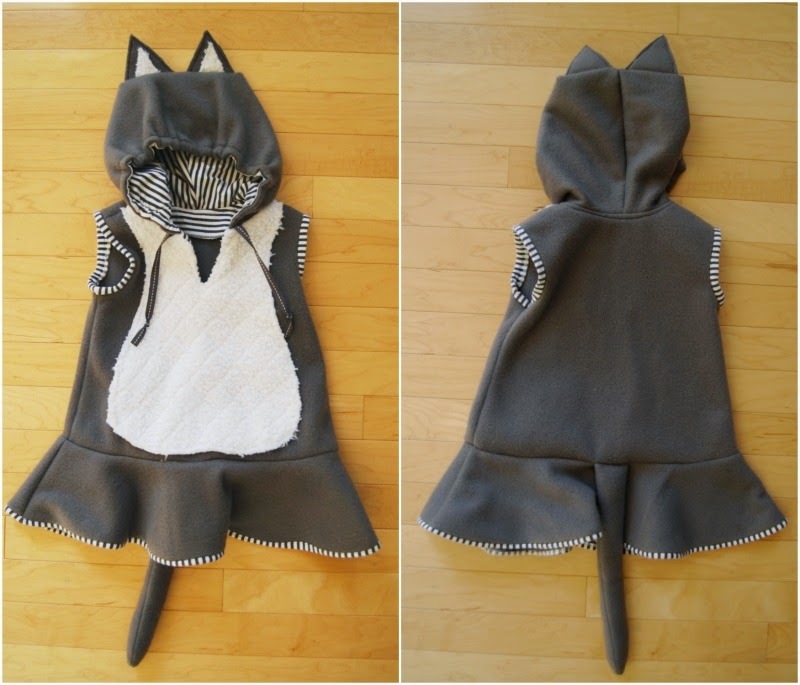 And also the fact that it is all one piece-- ears and tail attached. That makes it easy put on. She can't rip off the hood as she is wont to do with bows and hats. 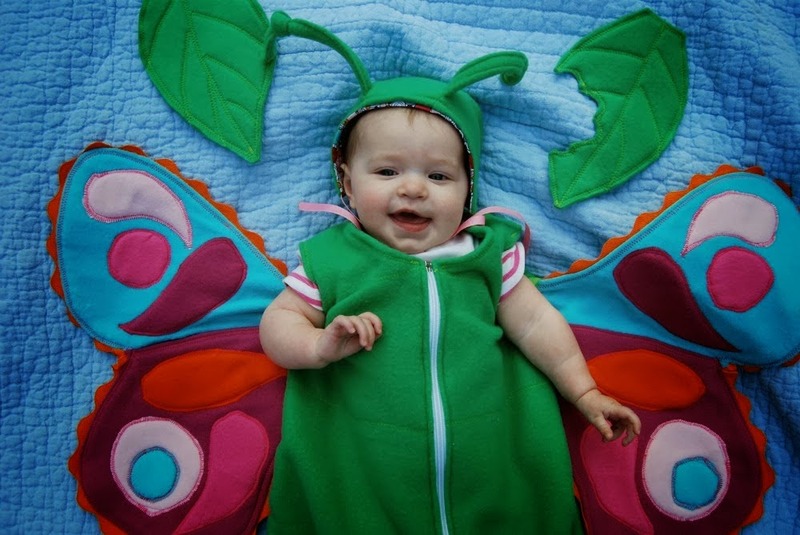 She wasn't so sure about it the first time I put it on her, but now she seems to like it. She stopped and pointed at herself in the mirror and said kkkkhhhhhhh, so I take that as a good sign. 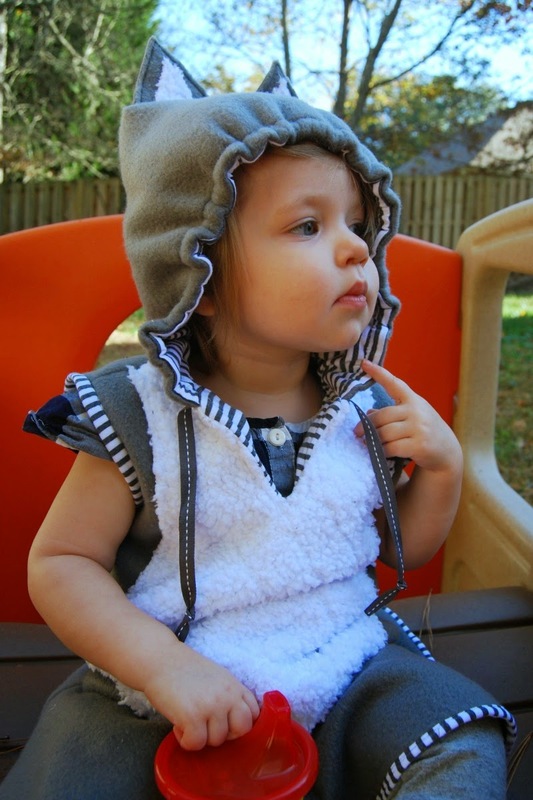 The biggest change I made to the pattern was turning the two piece hood in to a one piece hood. I did that because I thought the horizontal seam across the top would be the perfect place to put two little kitty ears. However, it did make the shape of the hood kind of block-like. Which is pretty funny from behind. If I did it again, I'd probably just tack the ears on the outside of the hood. Although putting them in a seam does make for a cleaner finish. Anyway, it's cute. She kind of looks like batman from the back. 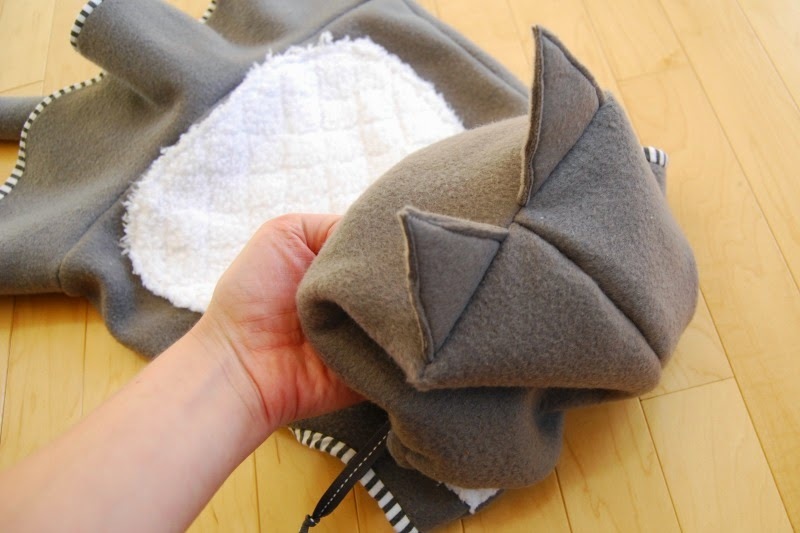 I love that the pattern includes a bit of elastic in the hood. Great way to keep the hood on a busy toddler head. The tail is stuffed with a little bit of poly-fill. I bound the armhole and skirt hem edges with the same striped knit I used for the hood lining and facings. The fluffy white tummy is some of that super squishy minky stuff. The grey is just plain old cheap-o fleece. The colors were chosen to match this guy. I tried, and tried, and tried to get a photo of the two together. 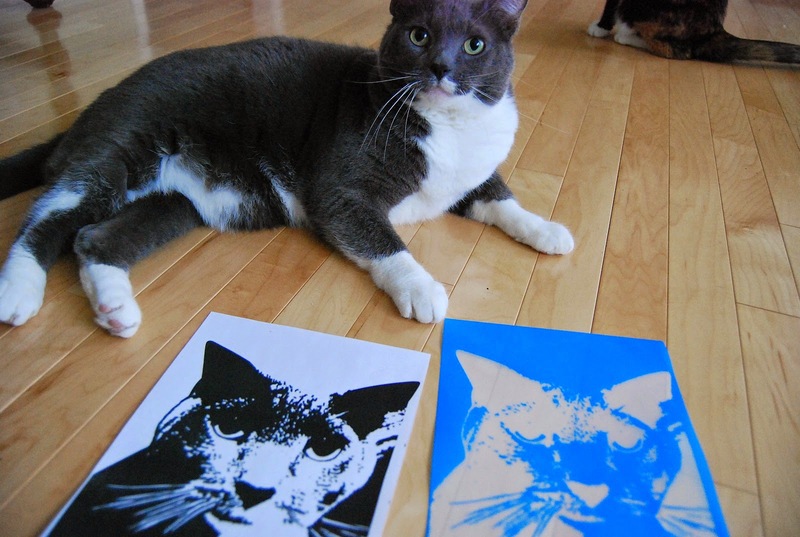 Jane in her costume with the cat who inspired it. Socks would have none of it. He is pretty patient with her "petting" for the most part. He'll put up with almost anything if it means he gets a little bit of love. What about you guys? Anyone else sewing any Halloween costumes this year? 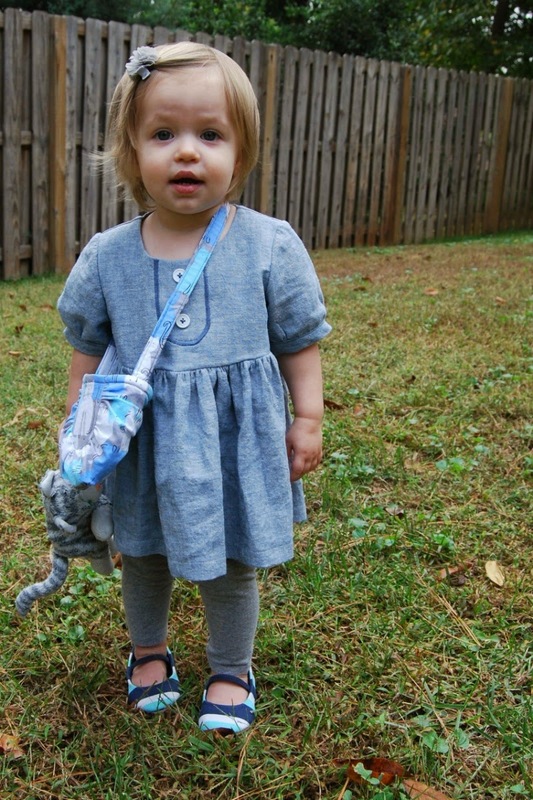 Any suggestions on getting a cat to pose for photos with a grabby toddler? I'm starting off with a cute picture, but let me go in to the 'losing' part first. I'm embarrassed over how much time I spent working on this sad, droopy, horrendous skirt. It's Simplicity 1366 in case you are wondering. It's almost totally complete except for tacking the bow in place. It's so, so incredibly frumpy. 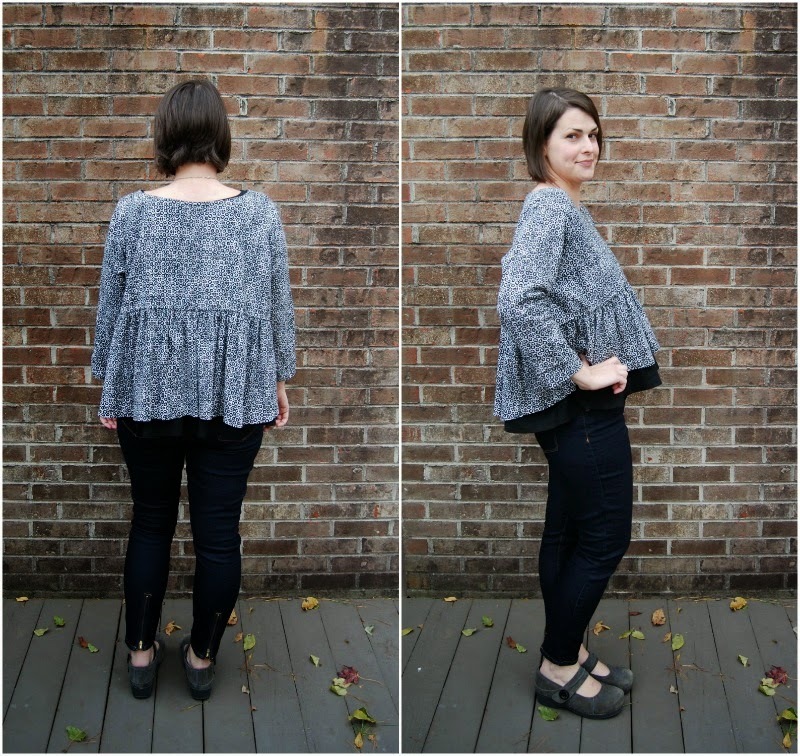 I can't even believe that this amount of frump is possible out of such a cool looking pattern. Just don't. That's my only advice. To be fair, I did some grading to make the pattern fit just using the flat pattern measurements. I accidentally bought the lower sizes and I needed to grade up just a bit. It is entirely possible that this sad, droopiness is my fault. But, eh. I'm still a little miffed. I think the skirt would probably work in a wispy, super light-weight silk. Anyway. Moving on. I am having a go at the top from the pattern. That one seems to get pretty good reviews. I'm still having lots of sewing fails. I can't really put my finger on why I'm so dissatisfied with so many things I've made lately. There are more but I'm not blogging them all. My ratio is less than fifty percent right now. Ugh. 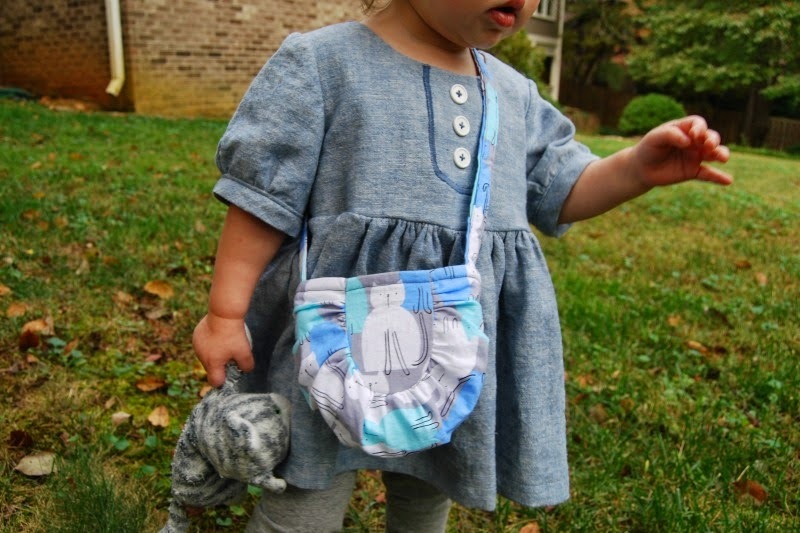 However, when you need to rebound fast from a sewing fail- make something for a cute toddler (win!). 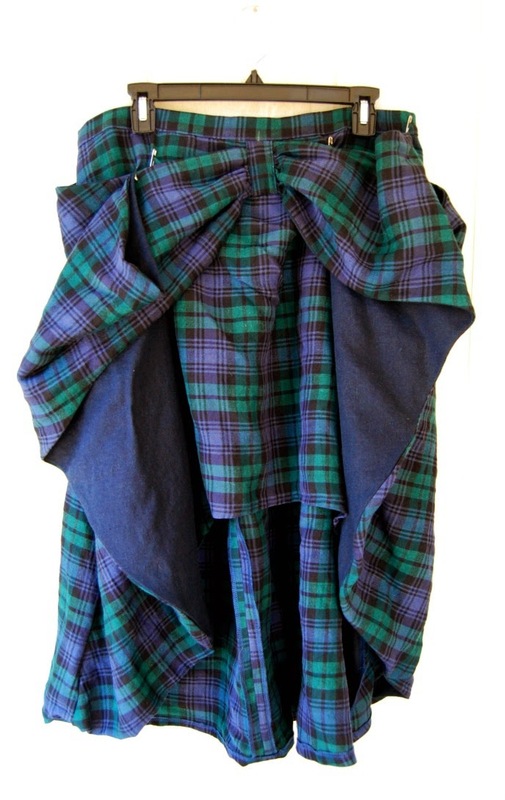 I have been hanging on to this blue watch plaid linen for several years now searching for the right project. Which is why the skirt fail hurts so much. 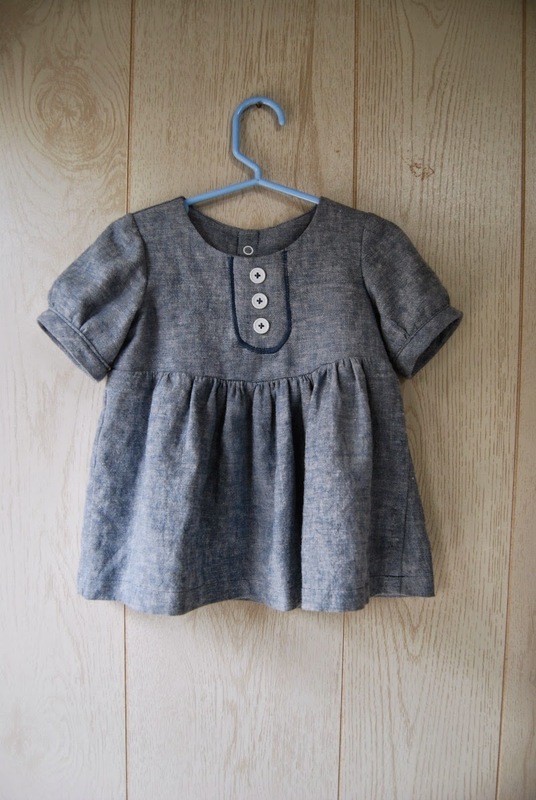 I pulled out the teeny, tiny narrow scraps I had left and cut out this Oliver and S Pinwheel tunic for Jane to try and save some of that precious linen. I had so little left that I had to piece the front and use the midnight blue for the back. Which I really like. 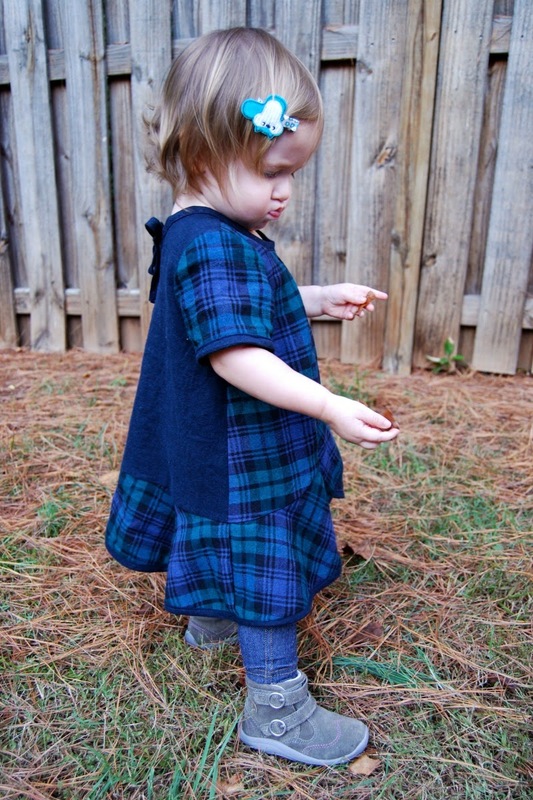 And no matching of plaids here except for the center front seam I had to create. Oliver and S patterns are just fantastic. I can't gush enough. Especially after sewing the monstrous 1366. I cut a size 2 which is pretty big on Jane right now. 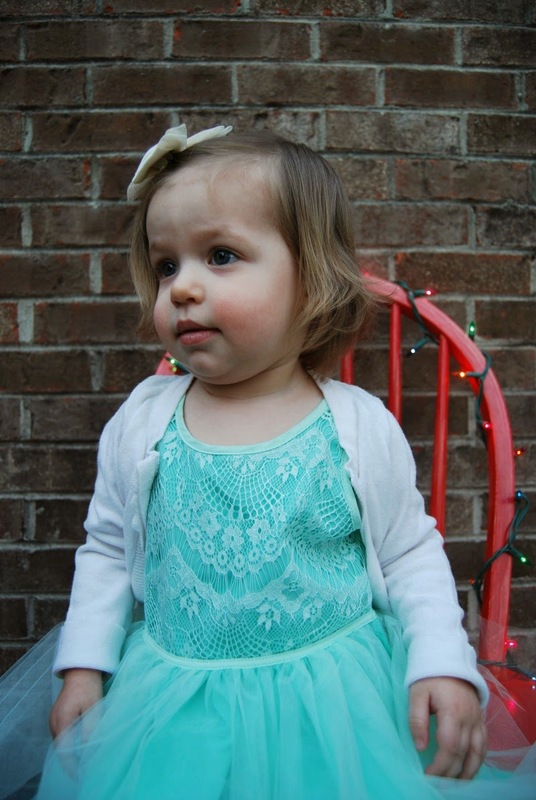 She's eighteen months. I originally sewed the binding around the neckline without thinking and turned it inside like a bias facing. I realized my mistake and decided I wanted to fix it to match the bindings on the sleeve hems and flounce. So I unpicked it (after it was under stitched and serged) and completely stretched it out. Hence the inverted pleat. I put the pleat in the neckline as a save. And I like it ok. I thought the inverted pleat sort of matched the vee of the flounce. I think it ended up pretty cute. 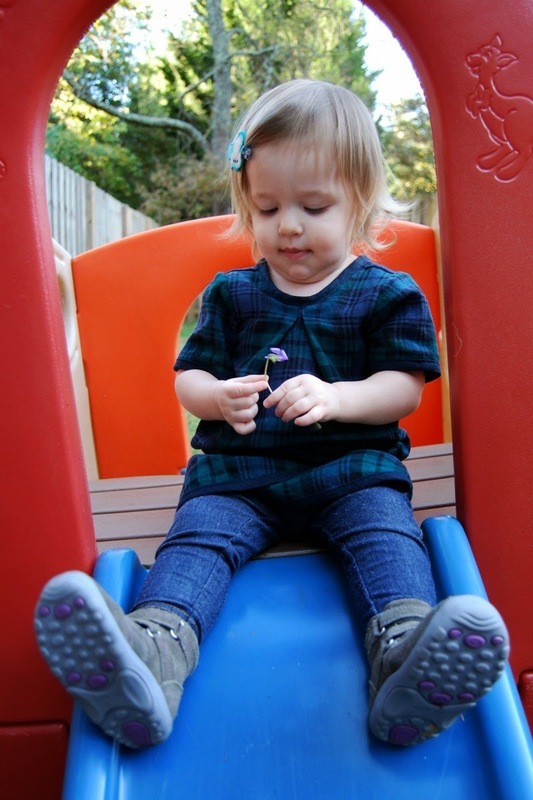 Doesn't hurt that the most adorable toddler in the world is wearing it. 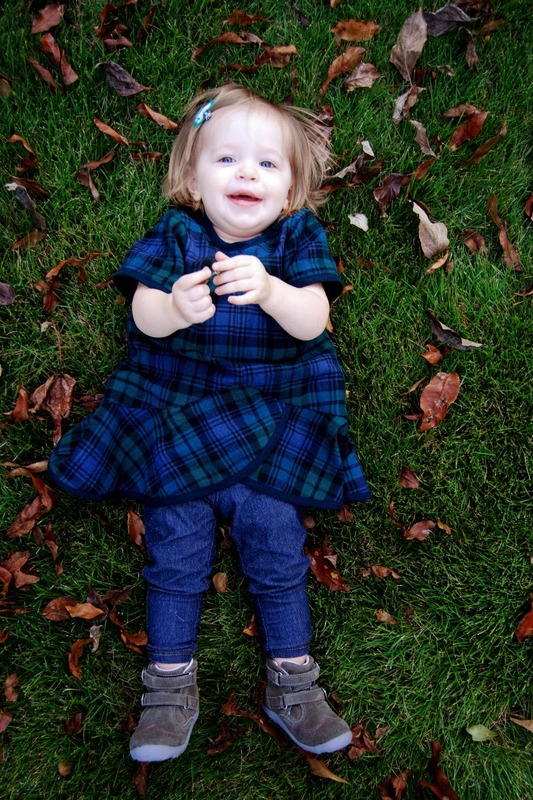 She looks ready for fall in her blue plaid and boots. I also just extended the bias binding to make the ties at the back instead of sewing ribbon to close the keyhole. 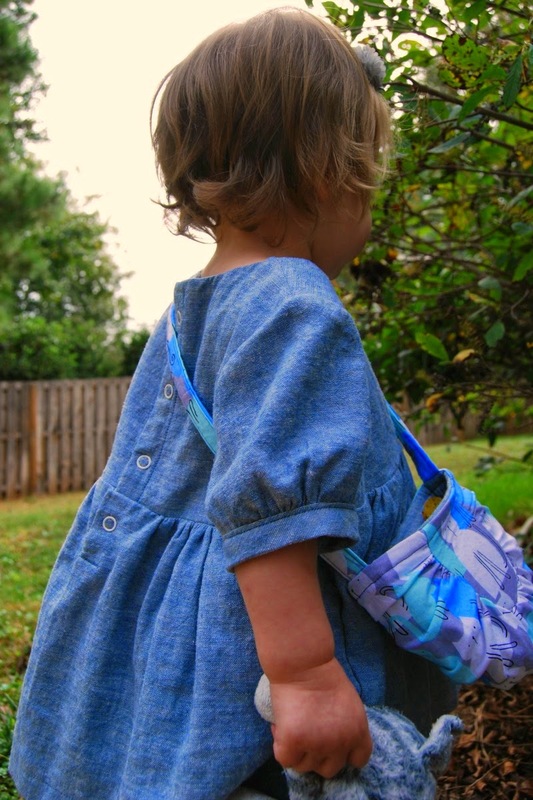 I love sewing, obviously, which is my main reason for keeping this blog. 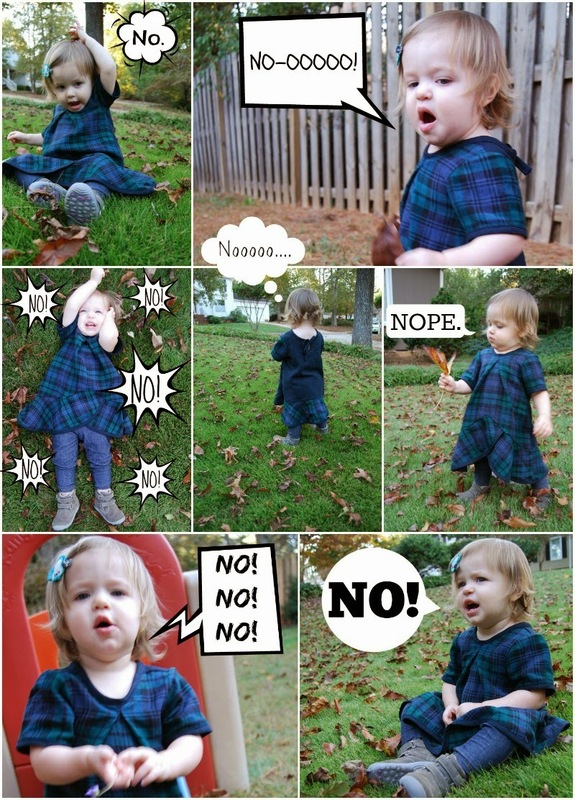 But I also love that my blog documents all these little moments in time. 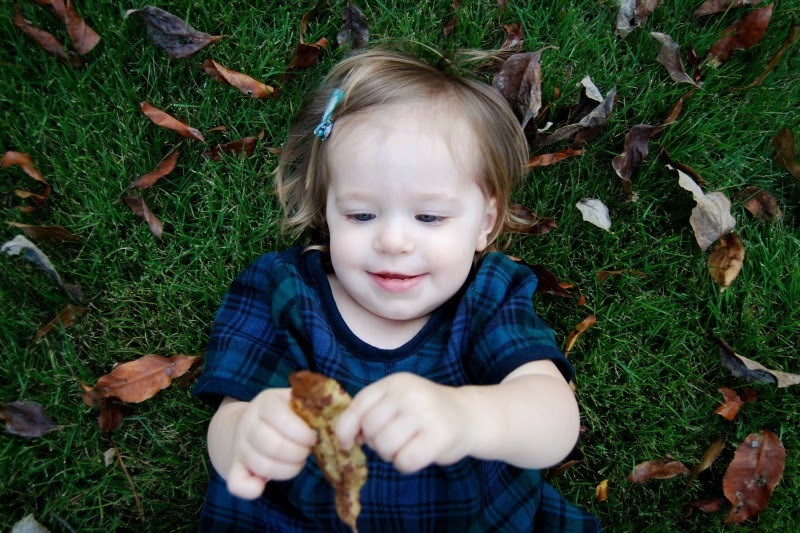 This was just another weekend that I snapped these photos of Jane. I know I will cherish them forever. She is a doll. And just for fun, here is a photo with illustrated sound effects. No. No no no no no. If I only had a penny for every time I heard that word come out of her mouth. We have to try very hard not to laugh and encourage it even more. It is hilarious. But it is just about all she says these days. I've been trying to teach her 'yes' but then it just sounds like we are arguing. Oh my goodness. I have to look away, it's almost too much. The cuteness. My baby is not a baby anymore. 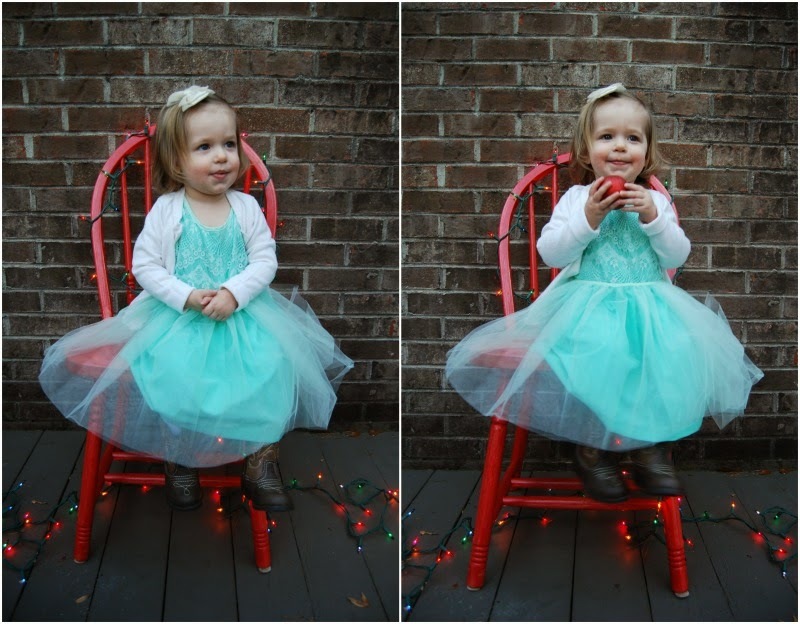 She really looks like a little girl in these photos. I can't believe it. 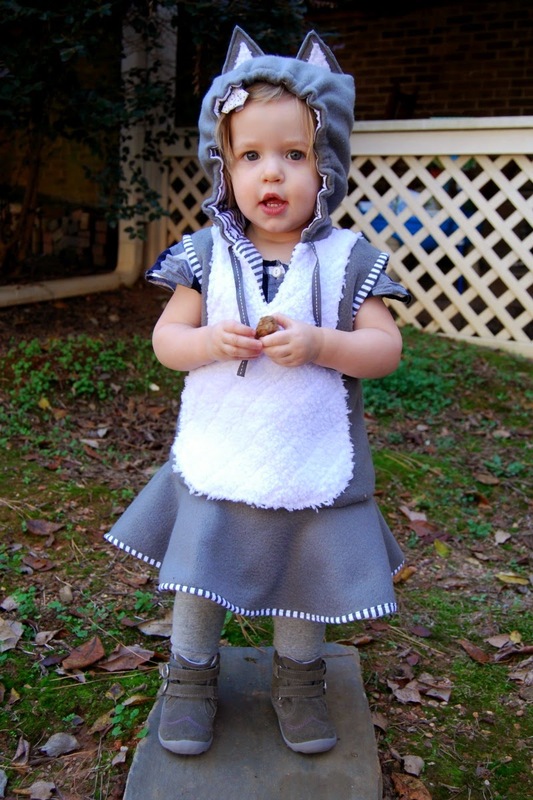 I won a giveaway for both of Lisa Lam's new children's patterns over at Scruffy Badger Time recently. 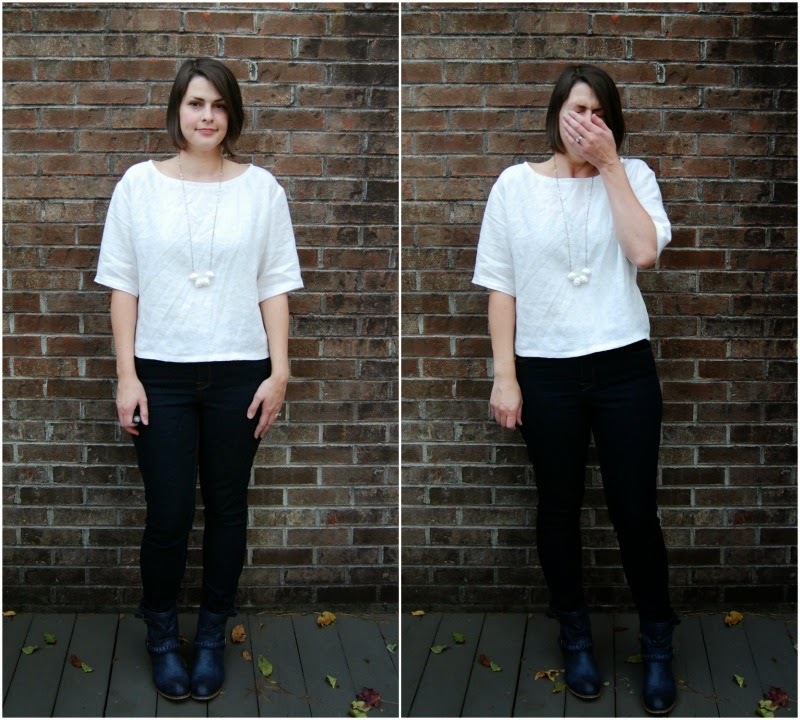 I know you probably saw the blog hop going around. 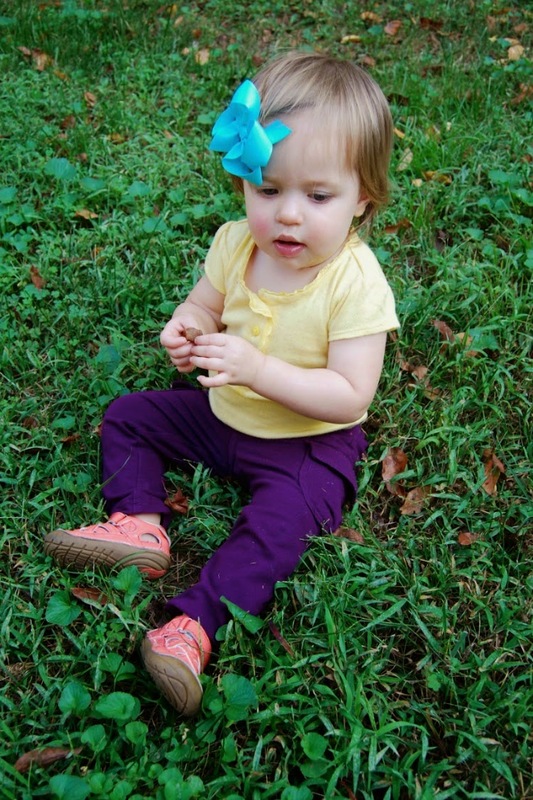 I entered a couple of different giveaways hoping to win as both patterns are incredibly cute. So I was super excited when Winnie emailed me. 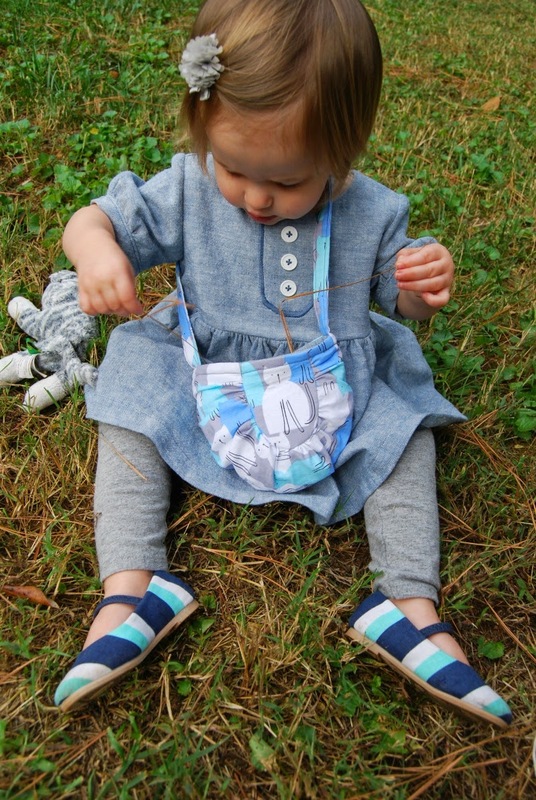 I planned on making up the Happiness Halter Playsuit first, but when both patterns arrived I noticed that the Dance With Me pattern included a pattern for a matching purse. Yes, that's right. A matching purse. The way the patterns are packaged may be the most awesome I've seen. The whole booklet is a pocket folder. There are full color pictorial instructions first and then the pattern tissue is tucked neatly inside a pocket at the back. The whole thing lays flat and is easy to use and refer to while sewing. It is some seriously fantastic packaging, which I am a total sucker for. It makes me want to somehow put all of my patterns in to pocket folders for storage. I might have to look in to that. I am lost in a sea of pdf pattern pieces at the moment. 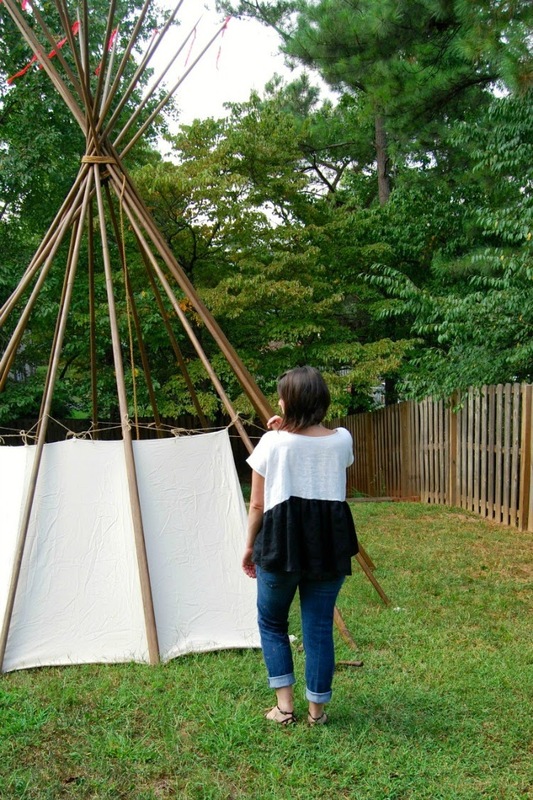 Anyway, I opted to make the tunic in a linen/cotton blend. I made up a size 2 without any changes except for lining the bodice instead of using the facing pieces. There is plenty of room for Jane to grow. 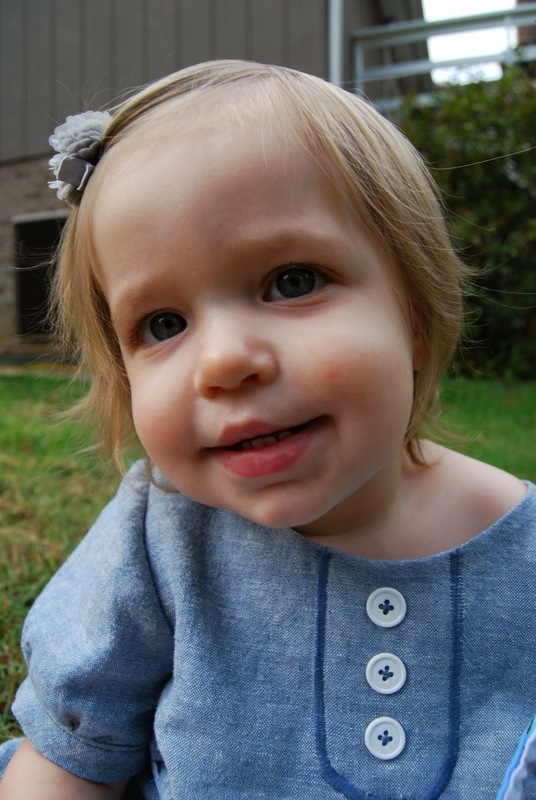 She is almost 18 months now, by the way. I really love the pattern design but I have some major criticism about the pattern instructions. They are craaaazy all over place. The order of construction is super wacky. I didn't follow it because it skipped around so much. Instead, I constructed the tunic in the order that made the most sense. You know, front placket, bodice, skirt, sleeves, hem. I think the pattern instructions have you start by gathering the sleeve heads and hem (since there is a cuff) but then you just set them aside until later on. It was really confusing. In fact, I noticed in the illustrated photos that the example wasn't sewn up in the order that the instructions called for. I'm being nit picky, I know. But the instructions could really be simplified. They are incredibly wordy, too. That may just be my personal preference. I like simple and concise. There is a so, so, so much information included. I think for a total beginner, it's too much information. It's a little overwhelming. I also found the pattern to be pretty challenging. 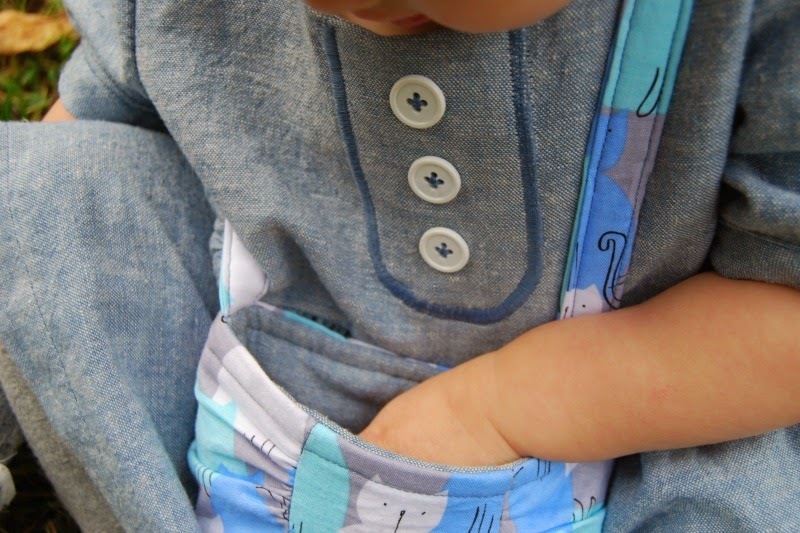 The continuous placket, tiny sleeve cuffs and curved front placket. I had to stretch my precision sewing muscle a little. Which I am not very good at. I followed the instructions for sewing gathering stitches to turn under the curved front placket. And it came out sort of smooth. I sewed it on the bodice anyway thinking it wouldn't be that noticeable. But when the tunic was complete, the uneven placket stuck out like a sore thumb. So my solution was to sew a close zig zag stitch over the lumpy edges. It's a little rustic but a hell of a lot better looking than it was. The continuous back placket was hard, too. 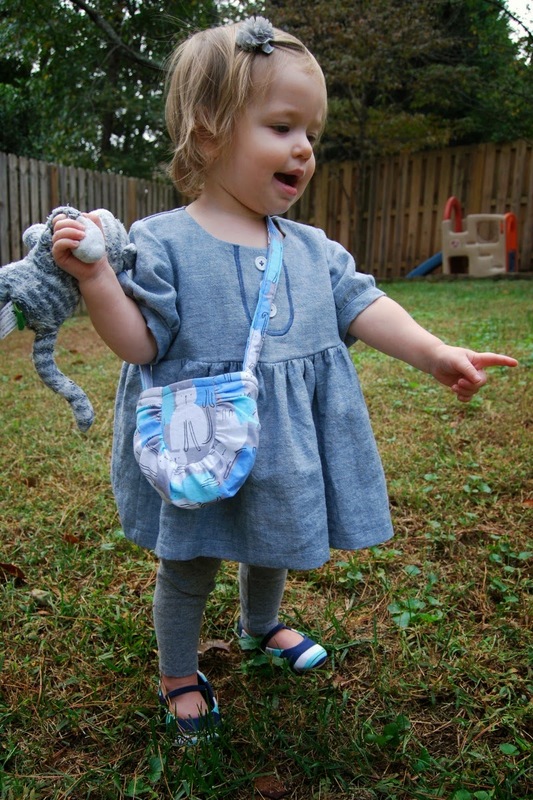 The purse is my favorite part. Kitties! Jane is obsessed. 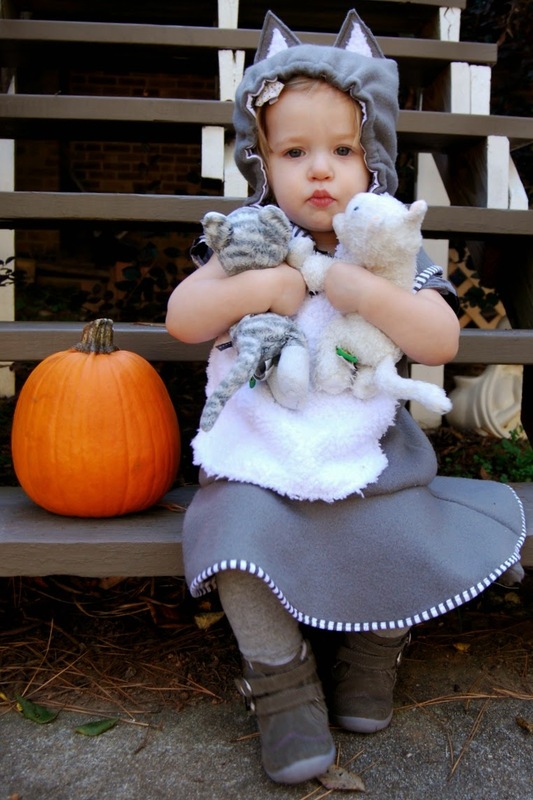 That little grey stuffed kitty goes everywhere with her. I think we may need to get another one on backup in case anything happens to this one. Any guesses as to what her Halloween costume will be? 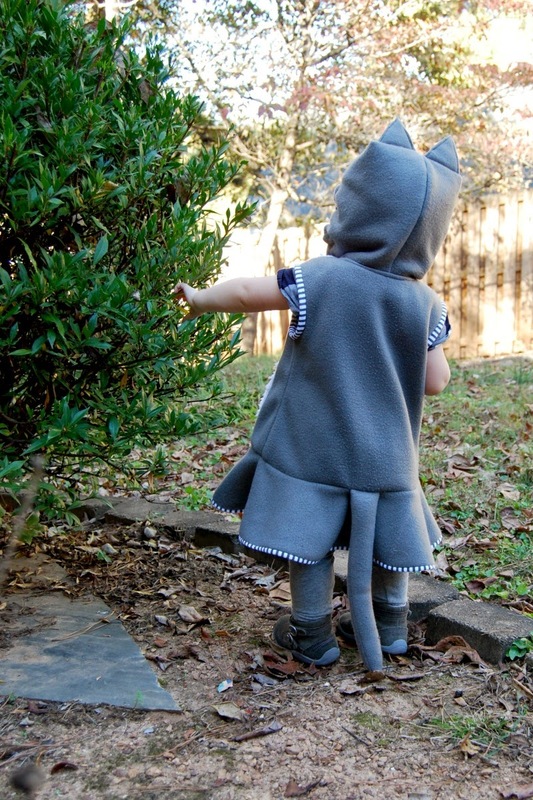 I was originally going to sew the tunic in the kitty fabric also, but decided it might be too much. I did the purse lining in the linen. She loves the purse. She walks around with it and stuffs anything and everything in to it. It's incredibly adorable. 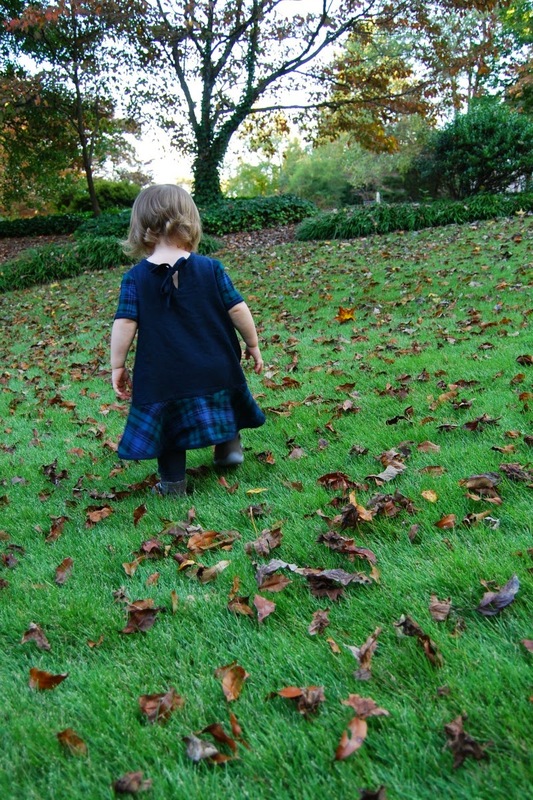 All in all, I really liked sewing this tunic up and I especially love the end result. I'm psyched to add both patterns to my library. I know they will get used a bunch. 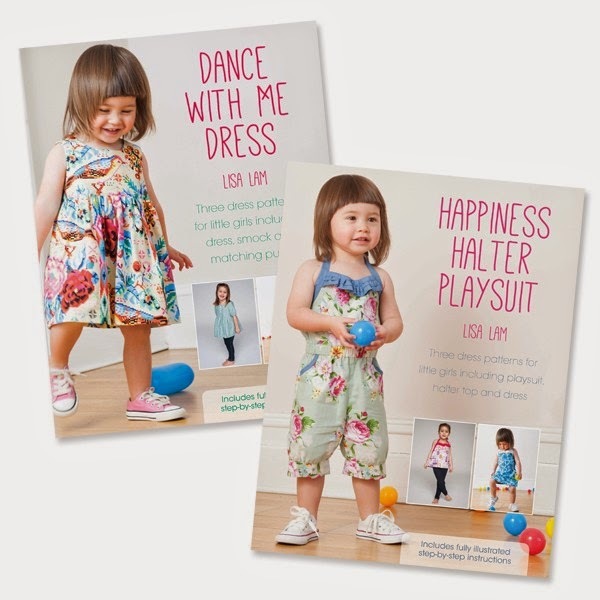 I am already working on a dress version of the Dance With Me pattern and you better believe I'm making some playsuits in the spring for Jane. That's her running away from me while yelling, "No!" Her new favorite word. She has also taken to slapping things out of my hand when she doesn't want them. She likes to do that in public places when strangers are commenting on how sweet she is. Ah, toddlerhood. She's a little tyrant. But a cute one, at that. I am enjoying every minute! So, this is where you tell me I should have made a muslin. I know. And to make matters worse, I have have seen so many awesome, awesome versions out there in the interwebs. Argh. Look at this beauty. I used a beautiful warm grey linen from my stash that I have been hoarding for ages. And neon green buttons. I love them. This dress has all the makings of being something really fabulous. And yet, it's not. I finished this the other week and put it on. And even J, who compliments everything I make no matter what, wrinkled his nose. I'm not willing to put it on for blog photos. Sorry. Most of the problem is that it's way too big. I think this is a combination of making a size too big and also the linen I used. I should know my measurements, I know. But they have changed so much in the past couple of years. I erred on the side of too big and I got it. The linen I used is a heavier 100% linen. It's one of those linens that kind of has a life of it's own. I spent a lot of time trying to tame it and make it do what it was supposed to do. It was difficult to work with. It's the kind of linen that will age nicely but is stiff and unforgiving at first. And forget about gathering (don't look too close). I had to zig zag over heavy thread and I still snapped the thread twice. It took me several attempts to gather the skirt. The armholes ended up too low, which only reinforces the fact that I need to size down. I didn't make any other changes except for lengthening it two inches. It could also be because I'm just not supposed to wear dresses without waist seams. Didn't I learn my lesson last time? 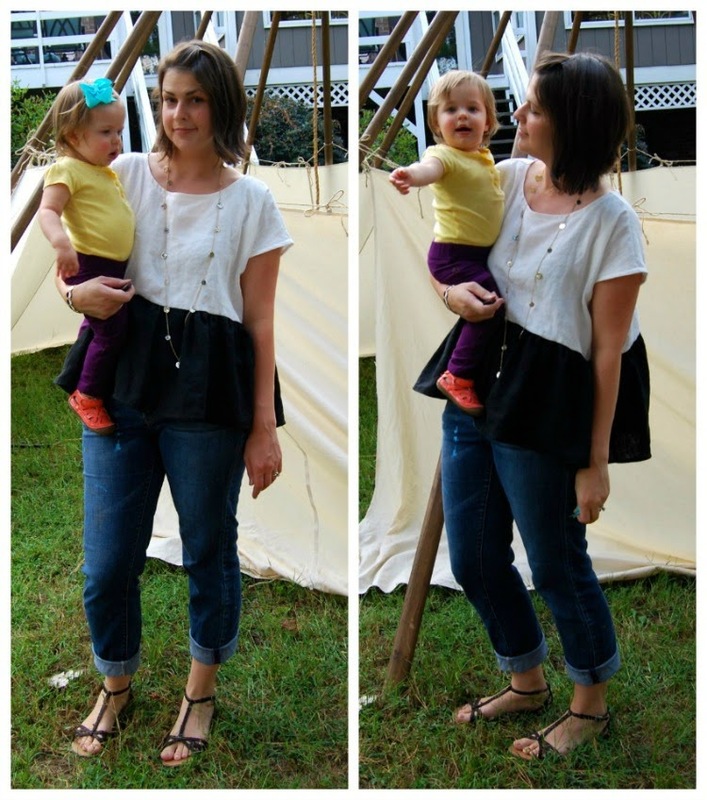 I know I mentioned that the black pom pom top in my last post was my favorite make ever. But I think it's already been surpassed by this little black and white number. I know. More black and white. I told you I went on a black and white fabric shopping spree. It really has made getting dressed in the morning easy, but I need to add some color in soon. This top is a modified Jacqueline crop top, another pattern from Tina Givens. I bought several of her patterns this summer during a sale. 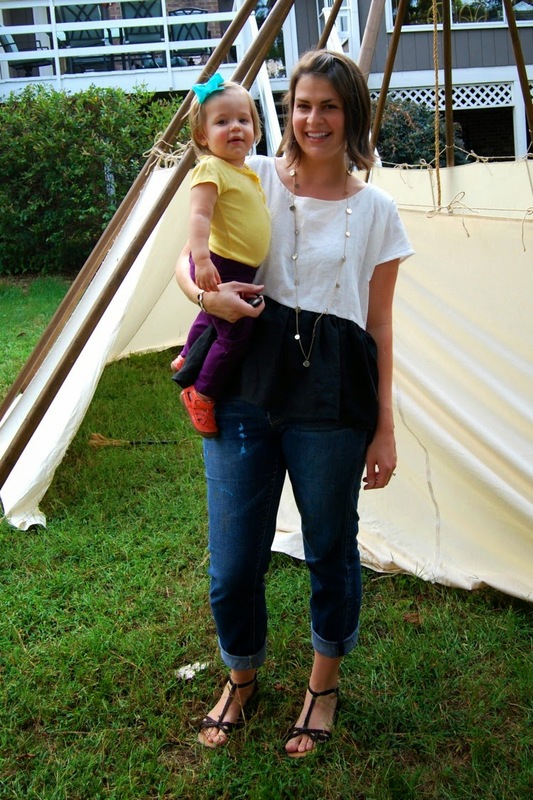 I bought this particular pattern on a whim because the crop top reminded me of my favorite Free People blouse. I made the spotty version first. The fabric is a printed linen I found at Joann's. The first version is made up exactly as drafted except I lengthened the back skirt by two inches and I only used two pieces to make the skirt. I don't know if my linen was wider than what the pattern intended, but cutting three pieces the width of the fabric seemed overkill. Isn't there some magic ratio where you can no longer gather fabric? So I only cut two. Then I matched side seams when sewing the skirt and bodice together. 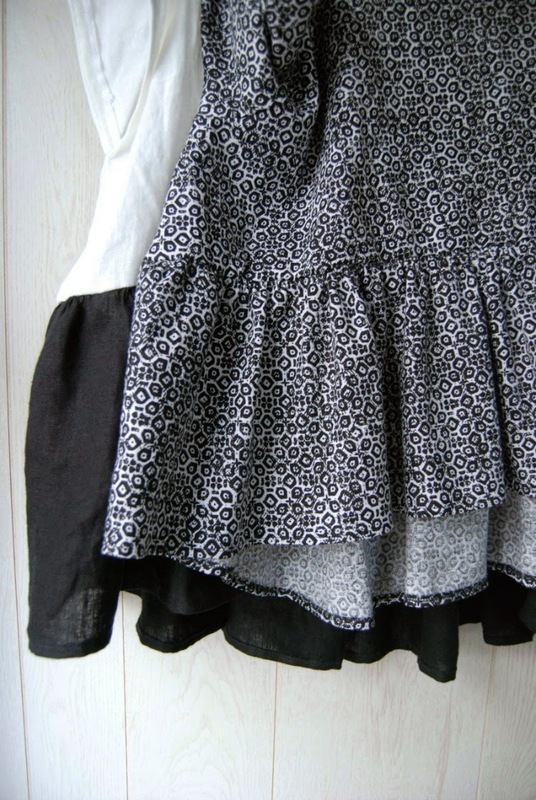 Just beware that if you do the third skirt piece, your ruffle with be very ruffly. The crop top is intended to go over a longer slip. I love the volume but I'm not sure how I feel about the volume and all the layering. I may try the slip but I really just bought the pattern for the top. I didn't take any photos of me wearing the printed linen version but I am really digging it. The sleeves are great. Three-quarter length, easy at the top and narrow at the wrist. I made the front skirt the length the pattern specified (8 inches, I think). And it really is cropped. It looks good with a higher waist skirt but with pants it shows a little bit of belly. So I need to figure out something to wear under it. I'm thinking I may make a black linen camisole to go under. Or maybe I should try the slip. I'll work on it. The photo below is to show the difference in length between the two tops. I made the black and white version next. This time I lengthened the front skirt three inches and the back six. I wanted it to be a top I could wear with regular waistlines. And I did a cut on cap sleeve (same way I did it here) instead of the long sleeve. I love this top. It is the perfect swingy top. I know it looks like a big rectangle, but it isn't. There is some subtle shaping which really makes the linen hang well. Givens patterns are big and voluminous but I feel like they are done very smartly. That is a really funny word- smartly. Anyway, I feel like her patterns are drafted thoughtfully even though the instructions and technical drawings are sub par. 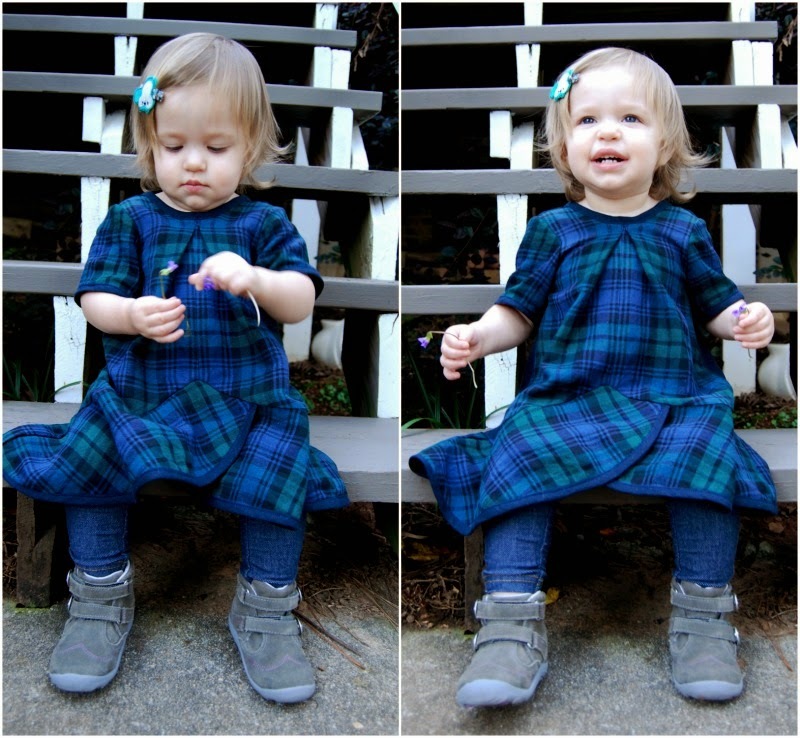 I've made a couple other things from her patterns which I've yet to photograph for le blog. But I do have to modify a little bit. I like the volume, but I also need a leetle bit more shaping if you know what I mean. And of course, the baby. Or should I say, the toddler. 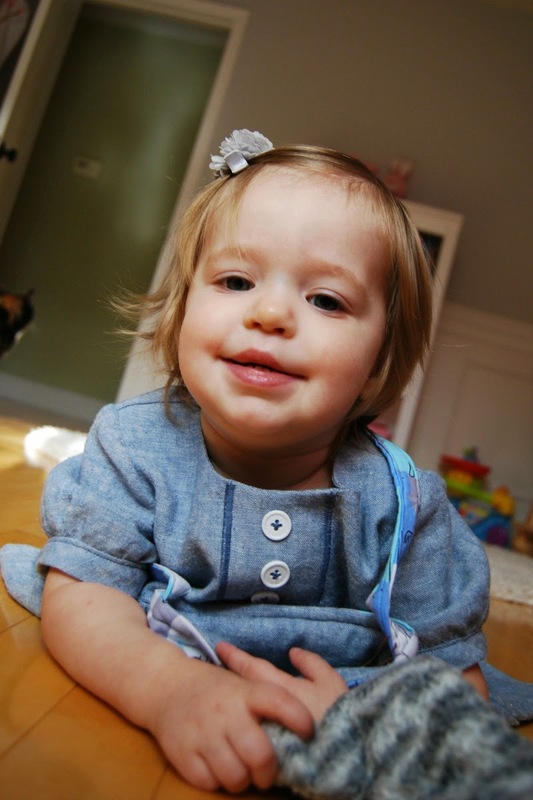 Jane is almost seventeen months now and is absolutely hilarious. 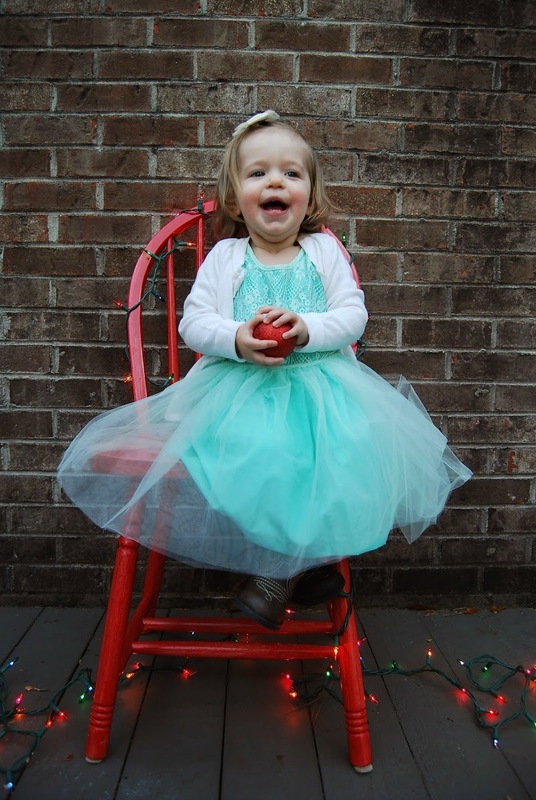 She has the best sense of humor and makes us laugh out loud all the time. And you should see the girl dance. She is a trip!